Here, I will list all the reasons why I will not vote for Modi. Before that I want to make it clear that I was a hard-core BJP supporter and my family has always voted for BJP in Rajasthan , but over the time I realized that BJP and Congress are two different sides of the same coin or in simpler words they are the same low-quality wine in two different bottles. I know this blog might receive many attacks and abuses by the Modi Army, who are never short of abuses on social-networks, but writing this is necessary to clean the carefully-crafted illusion developed by BJP over the years around the achievements of Narendra Modi. A report in Hindu says that 57 Candidates of Gujarat Cabinet have criminal cases on them. Well, I seriously don’t understand how my India will shine under Criminal Candidates. Can BJP stop giving tickets to criminals? If yes, then I can think about voting for them. RTI activists in Gujarat are suffering, their RTI Applications are not being responded to, and thousands of RTI applications are pending. Gujarat RTI Activists Association, which has around 5,000 members, says that there are around 14,000 RTI applications pending at different stages in various departments of the state government. According to them , these RTIs can expose corruption on larger scale. So stopping an RTI and Modi ji wants India to be like USA, no that’s not possible if you stop the Right To Information for your citizens. Apart from this , Why does Modi have to keep tainted minister in his Cabinet? Many RTI activists have received threats to life , RTI Activist Amit Jethwa was murdered and BJP MP Dinu Bogha Solanki has been held. Freedom of knowledge and Free Speech which can threaten the govt is silenced. BJP MP arrested for RTI Activists Murder. Is this what you call a strong Lokpal, when you criticize central government for bringing strong Lokpal, Mr Modi? If this is what you call a strong Lokpal, then all corrupt politicians would have backed Anna Hazare for this bill. Narendra Modi ji has claimed Many times that there are no riots in Gujarat after 2002, any intelligent person would try to do a re-search on this claim. 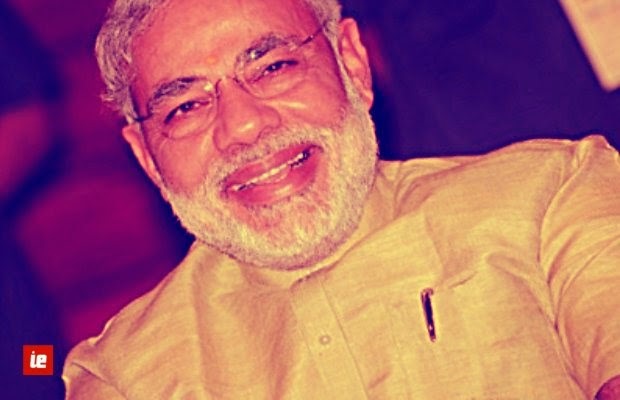 Read: No Riots in Gujarat in Last 12 years – Modi in India Times. Facts: Large scale riots happened within Vadodara in 2006 (no coincidence that next Gujarat elections were in 2007). Apart from that, regular stream of incidences involving arson, stone-pelting, stabbing, lynching etc kept on happening regularly all over Gujarat – Ahmedabad, Rajkot, Dohad, Veraval etc. Apart from these there are many riots which I am listing below for reference. So, it’s very normal to be rioting in any place of India and Gujarat is no-different. Either these reports are false or Mr Modi forgets deaths of people very easily. a) Claim: Modi Claims that Gujarat has generated 25 Lakh jobs generated in 2009 [Link] and also that jobs generated to be 52 lakhs in 2011 [Link]. Truth: Planning Commission Employment Report (page no 126)suggests that, number of people employed in major sectors has come down from 25.3 million in 2004-05 to 24.65 million in 2009-10. So, these high figures are for what when the Jobs have gone down from 2004 to 2009? b) Education: Let’s look at the Gujarat’s education Sector. Gujarat is the worst state in the country, when we look at the reading, writing and math skills of the rural students. Planning Commission reports Education Report. Only 7% of Gujarat’s class 5 kids can read English sentences, way below all India average and it’s better not to compare with other states. ASER survey taken in Jan 2013, establishes this fact clearly. A major part of survey was reported by DNA which can be read here: Gujarat’s class-8 literates can’t read. Its clear that Mr Modi is too busy in infrastructure and building roads that he doesn’t have time for future generations, he is aware that they can’t vote. d) Claim: Automobile majors are flocking to Gujarat because of great industrial climate Modi has created. Modi Gives Rs 30,000 Crore Loans to Tata: Free public money in form of Rs 9,570 Crore loan as the interest is 0.1% and payment time is 20 years (23% of Gujarat’s budget for that year). Plus, usual sops of tax and duty exemption, infrastructure development and 100 acres of land near Ahmedabad for township. Which businessman will refuse such a deal? Gujarat’s villages were fully electrified by 1996 (or even before), Modi has no role in 100% village electrification. Electrification of villages, Page 23, Annual Report 1996-97, Ministry of Power. Moving on to availability of electricity, refer to a report of Census 2011, Availability of Electricity Census 2011. Percentage of households using electricity as the source of lighting in Gujarat is 90.4%, ranked 14th behind big states like (TN 93.4, Andhra 92.2), many smaller states and UTs. Thus, Gujarat is not the leader in providing electricity to its populace. Interestingly, Gujarat rank fell from 12th in 2001 Census to 14th in 2011 Census. Fact: Less than 50% Gujaratis are voting for Modi and around 40% are voting for Congress. BJP’s high vote share pre-dates Modi. 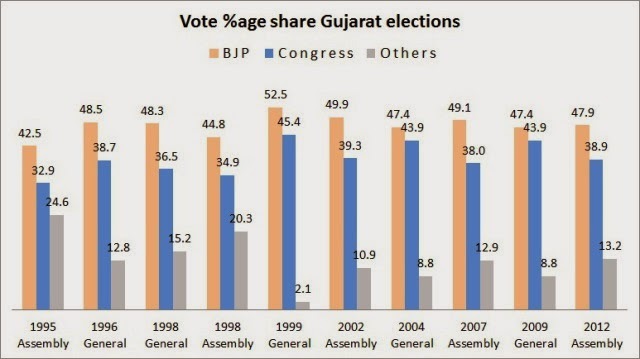 In last, General Elections (2009) in Gujarat, vote share difference between BJP and Congress was only 3.5%. Correspondingly, seats won BJP 15 and Congress 11. In India electoral systems, winners are based on seats won in which Modi/BJP is clear winner, but that does not mean everyone in Gujarat is voting for Modi/BJP. Within Gujarat Congress too have a healthy vote share in range of 40%. Fact: Plain lie, In last 6 years, Gujarat’s agriculture had -ve years of growth -1.08% (2007) & -8.71% (2009), and a zero growth year 0.3% (2010). Gujarat has had a very peculiar growth rate for agriculture. 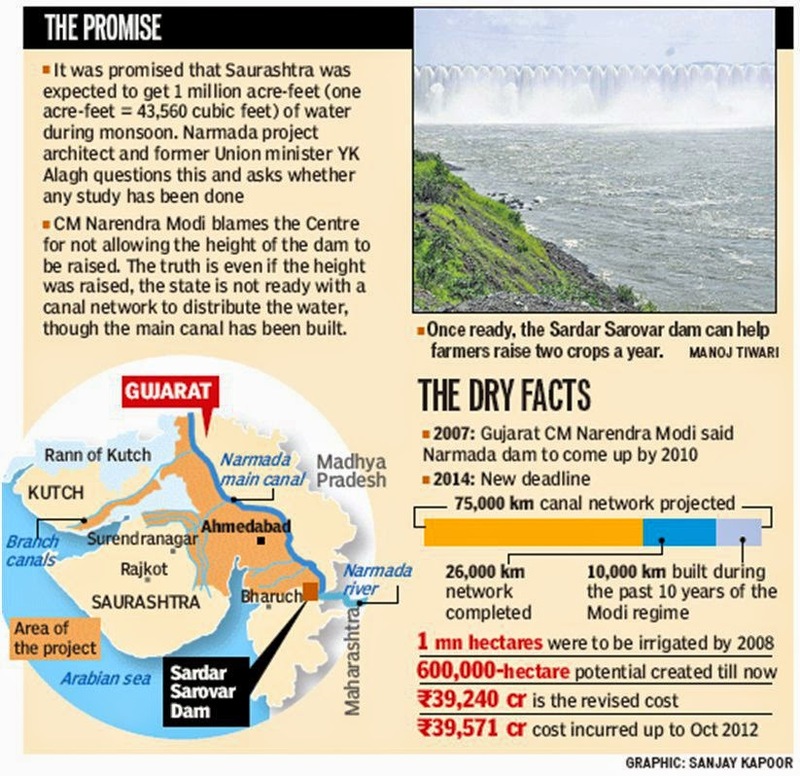 Although I have to say that the Sardar Sarovar Project has had a huge impact on agriculture in Gujarat. Furthermore, another data table of Ministry of Agriculture, mentions Gujarat’s agriculture from 1996-97 to 2010-2011 (not given whether it is at constant/current price or gross/net DP), to have frequently years of high negative growth and high positive growth, the variance is so high, by selecting a year, the corresponding growth can significantly change over a period. By no stretch of Imagination, Gujarat has 10-11% Agriculture growth, if that would be .. would the farmers do suicides in Gujarat? yet another lie exposed from RTI. What drove 135 Gujarat farmers to suicide? h) Claim: Gujarat is the only state in country to have “high speed wireless broadband” service in its all 18000 villages. Fact: BSNL brought that to Gujarat. Ironically this is one of deals for which former Telecom minister, A Raja, is under investigation. Incidentally, BSNL-SOMA WiMAX deal is under investigation in corruption saga of former Telecom Minister A Raja. A Raja may be booked in BSNL’s WiMax deal [Link]. In other words, it’s A Raja, who bought WiMax to Gujarat. Intending to say, Modi made the Asia’s biggest solar plant? Clearly Rajasthan and Gujarat, being the biggest desert states in India, solar program was likely to have the largest impact there. Due credit to Gujarat though that it beat Rajasthan to first place. j) Also Modi PR people have claimed that “The entire length of SSNL canal network in Gujarat is around 19,000 kilometres and if even 10 per cent of it is used for this type of projects it could generate 2,400 MW of clean energy annually.” People have touted him as if he was the inventor of the idea of putting solar panels over the canals. Fact: Again plain lie, First and foremost, the World’s first over the water solar power project is in California, United States. It’s functioning over a pond since April 2011 (picture above and below). Thus, there is nothing original about the idea of solar panel over water nor Gujarat is first to implement that. In last one and half year, after 1MW launched in April 2012, not a even one MW more is added. At best there are few “announcements” of Gujarat government to fund 10-20 MW. No news of any further construction as of now. Perhaps Gujarat’s bureaucracy knows; The whole thing was just a publicity stunt, why waste more money on this one? The 0.75 km is the total length of the existing canal top solar panels; somehow fan boys are convinced that 1,900 km (2,500 times) is being covered on war footing and try to force this lie with full rhetoric over anyone skeptical. Just to add, the original purpose of Narmada canals, to bring water to parched lands of Gujarat (a high priority task for any Gujarat CM), as ofnow remains way behind schedule. Only 35% of the total 75000 km canal work is complete and in Modi’s 10 years as CM, 10,000 km is dug. Modi’s announced deadline of year 2010 for the task expired 3 years back. And was this not enough? Now facts coming out that a person who earns Rs 11/ Day is not below Poverty line in Gujarat and so the person who earns below Rs11/day are 24 lakhs in number . Read, Rs 11/day and you are rich in Gujarat. Apart from that, the silence of BJP on section 377, their links with LTTE Funded Viako (please google for that), Baba Ramdev’s and Subharamaniam Swamy’s dual nature forces me to not vote for Modi. Silence of BJP big wigs on Asaram bapu case too is worrying . Apart from it, Wikileaks never said Modi as fully un-corrupt and the whole cable tells Modi to be communal, and a ruler by few means and coruption in Oil refinery is evident. Wikileaks Cable on Modi – I see fake claims which say Wiki leaks founder Julian Assange said that “US Does not want Modi to be the PM because they are scared “, that too is a plain white lie. Half of the followers of the Modi is fake, he purchases sponsored likes on Facebook , who funds BJP? Can BJP be transparent about it’s funds? Why BJP was funded 1 Crore by Dow Chemicals? 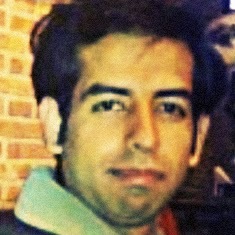 The company responsible for Bhopal gas tragedy? Can BJP explain? As if these reasons are not enough, Modi’s tongue slips many times, he said Mohandas Gandhi as Mohanlal Gandhi, said Alexander came till Bihar, Takshila was in Bihar and what not ! He is a good speaker no doubt but is speaking facts is too much too ask for?